La Posada is one of the many Latin American holiday traditions in which participants symbolically retrace the steps of the Virgin Mary and Joseph on the night that baby Jesus was born. In candle-Led light procession, two students (traditionally chosen from the Latino Floor) dressed as Mary and Joseph lead followers across the campus to three stops and ending with pan dulce and champurrado. 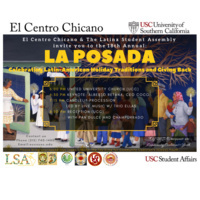 USC students, faculty and staff members are invited to participate along with families and local community members! Procession featuring Latin-Grammy Nominated Trio Ellas. Community Coalition Youth will be our Toy Drive recipients. We will be requesting unwrapped Toys for Ages 1-18.